Do you need a dining room mirror, bar mirror or living area mirror? 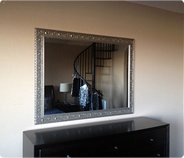 We offer great selections in many mirror styles and sizes. We custom frame all types of dining mirrors and bar mirrors. Our mirrors are made in Texas of highest quality materials. We offer mounting hardware for our dining and bar mirrors that allow for hanging in hard to fit areas. Remember, a great mirror will make your dining room look bigger and more elegant. We suggest you put mirrors in area that seem small and cramped. Kitchen nook mirrors, bar mirrors and large dinning room mirrors are all great ideas. 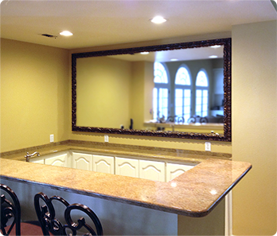 Our mirrors can match your counter tops and cabinets too. Many people need living room mirrors or open area mirrors to create a beautiful open area look. 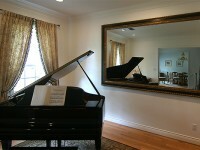 At Texas Custom Mirrors we can build very large mirrors to fit large areas. 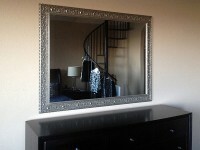 We offer many mirror frames that can match almost any decor. We offer hundreds of frame choices. We ship our dining mirrors, bar mirrors and living area mirrors nationwide.